Dr. Ayzin did an amazing job in reducing my gum-line. I never realized I had “normal-sized” teeth. I always thought my teeth were so small and really hated my smile. The procedure was painless and when Dr. Ayzin got finished contouring my gum, I could not believe it. I had nice, “normal-size” teeth and a beautiful smile. I postponed visiting the dentist for years out of fear, and a lack of money. I need not have worried about either. 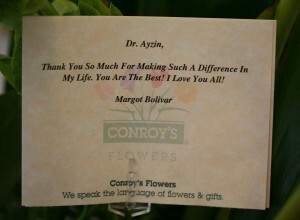 It was an enourmous relief to find Dr. Ayzin and all his staff. I have never been treated with such respect as an individual, and withsuch care and concern as a patient. 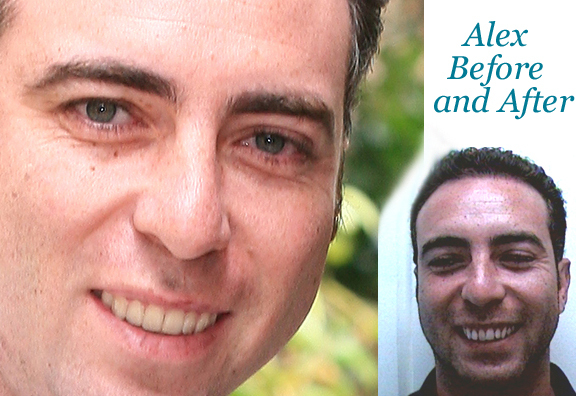 Dr. Ayzin helped me understand the latest in dental procedures and calmed all my fears. 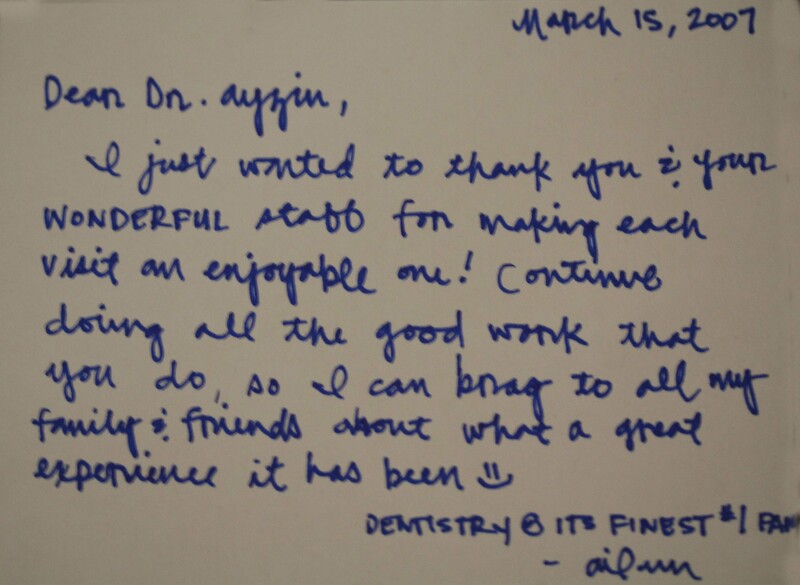 It was the right decision to go to Dr. Ayzin, and one that will help keep my teeth feeling and looking good for the rest of my life. I have nothing to say but good things! To watch a video of Gillian’s testimonial on her past dental fears, her experience at the Dentistry @ Its Finest and easy way to take care of the fees, please click the thumbnail . I’ll never forget your kindness. Thanks for easing my fears and being so kind. Good Morning Dr. Ayzin! I was a little nervous yesterday but are really a rockstar of a dentist because my mouth feels great today (no pain killers even!). I have been to dentists where the front office staff wasn’t helpful or friendly, I have been to dentists were I have had billing issues, I have been to offices where the hygienist wasn’t that great or didn’t seem to care about my health, to one where the dentist himself started arguing with his assistant right over my head while working on my mouth (talk about uncomfortable! ), and definitely to a few who didn’t seem to be as patient and caring as you. I have also never been to anyone who seems to do such great work. Every tooth you have worked on so far has felt just perfect. I am really glad I found your office and please thank the girls too: they are all so nice and helpful. I wanted to bake you all some cookies and bring them in but maybe after nobody is on a diet (ha ha). PS: I really appreciate Crystal explaining to me what was going on yesterday as the work was being done, etc. It’s very comforting as a patient. Have a good weekend and thanks again! I can’t even tell you how happy I am I found you guys. You are all awesome!!!! Every one was very friendly. And honestly, I’m very scared of needles, drills and pain, but every time I go to your office, I relax so much I almost fall asleep! This is a first! Everyone was wonderful. Rosemary was very gentle and thorough. 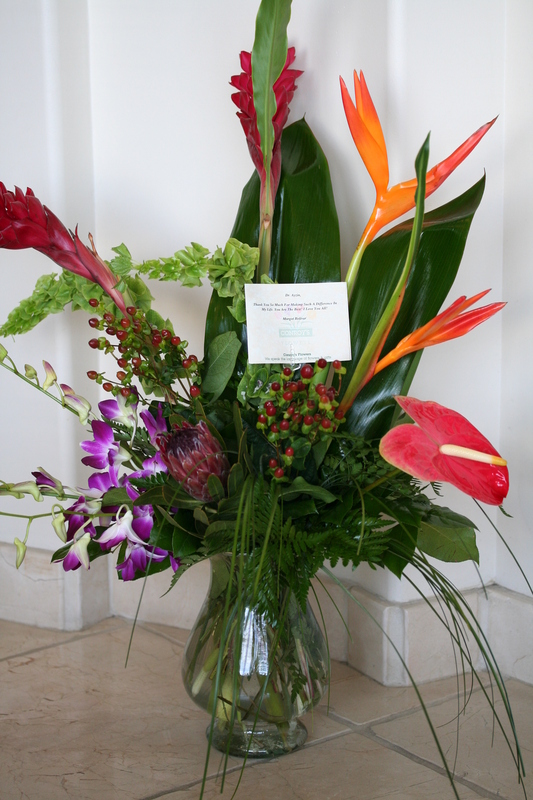 You have an attentive and efficient staff that made me feel very welcome. Thank you. The receptionists were very friendly, and Lala & crystal were so sweet to me, especially since it had been 10yrs since I saw a dentist & I was beyond nervous. 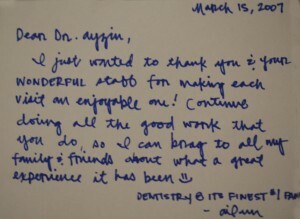 Dr Ayzin was cool & very communicative about all my fears & objectives. You guys rocked! I’ve already told my dentist scared friendsabout you guys. Thanks & see you all soon! Keep Rosemary around — she’s a jewel. And, thanks for the high tech — I like having all my teeth. Doctor Michael and Dental Assistant Crystal were very nice and made me feel very comfortable. They explained and took the time to help me decide. Many of the other staffs smiled and greeted me also. However, I didn’t feel like front desk greeted me well enough. She didn’t seem very friendly. I’ve been to many places that gave me friendly greetings as the first impression when walking in. I was also late for my appointment in Long Beach. I wanted to leave at least an hour in case of traffic to make it on time. One of the other dental assistant insisted that Long Beach was not too far and commented “What, do you drive 20mph or something?” That was uncalled for and there was traffic, which made me late to my meeting. Besides that, I had a great experience with greetings from both the Doctor and the assistant Crystal. I am willing to consider doing a procedure with them because of these two people. The entire staff was friendly and knowledgeable. The doctor had very gentle hands and did not hurt me at all. He never pinched my lips or caused pain at any point along my lip edge. He made sure that my mouth was as comfortable as it could be at all times. You all are the best. Thank you! Dr. Ayzin was very patient and informative, and I appreciated his attention to detail regarding my medical history. All staff were pleasant, reassuring, and accomodating. Rosemary was an amazing hygienist, and I’m actually looking forward to seeing you all at my next appointment. Thanks! You have an amazing staff! I am very pleased with the staff, and Dr Ayzin. I look forward to a long relationship and restoring my smile to the best condition possible. I always enjoy seeing the staff at your office, and making my smile better every visit. Please follow up with my good friend Valerie, she needs a new dentist, and I think she would really like your staff. Hello, I had you fix a temporary tooth that is on a stay plate. You folks did an excellent job accomadating me with my delema however the color doesn’t really match. But I will tell you that I was soo relieved just to know you would fix it! Thank you for taking care of me, I am grateful but I am scared to smile. Someday soon I know my teeth will be beautiful! Thanks again! Excellent as usual, really great team. Have recommended several friends already! If I had to make a negative comment, I sometimes feel like making money is more important than keeping the “necessary” work to a minimum. Everybody in your office is great. It makes going to the dentist just so much fun. To see and hear Linda, Larissa or Tammy share their experience at Dentistry @ Its Finest, please click on the thumbnail below.